The Encores! 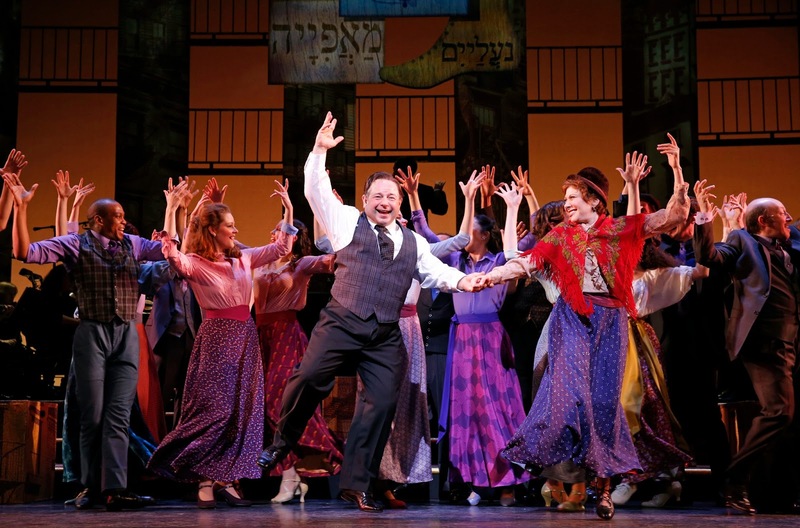 series at New York City Center goes back to its beginnings with a production of Fiorello! (book by Jerome Weidman and George Abbott, music by Jerry Bock, lyrics by Sheldon Harnick), a 1983 presentation of which launched Encores! two decades ago. Telling the story of New York City 's first three-term mayor, Fiorello H. LaGuardia (Danny Rutigliano), also known as "The Little Flower", the musical won the Tony Award for Best Musical as well as the Pulitzer Prize for Drama when it first premiered on Broadway in 1959. The current production, which recently finished its seven performance run, offered an enjoyable if not altogether stellar rendition of the tale. After a brief 1933 prologue, the musical flashes back to 1912 where a young and feisty LaGuardia is working as a lawyer, helping the city's downtrodden, i.e. the immigrants, sweatshop workers and the like, while railing about the injustices and corruption that are rampant in the New York political system. Convincing Ben Marino (Shuler Hensley), the local Republication political boss, to give him the nomination for the city's 14th congressional district, a district long controlled by the infamous Tammany Hall, and a seat no Republican has ever won, LaGuardia scores an upset victory. He then proceeds to live up to his mantra of sticking to his principles, especially when he feels he's in the right, no matter whose feathers he may ruffle. This becomes evident when he helps enact the Draft Act as the U.S. heads into World War One, LaGuardia himself enlisting to join those he helped send to war. With his star on the rise, LaGuardia also finds time to marry Thea (Kate Baldwin), one of the striking women he encounters on the picket line, much to the consternation of his long-suffering secretary Marie (Erin Dilly), who has long carried a torch for her boss. Fiorello! is both a love story, (several in fact) and an enjoyable satire on the world of politics. In the latter case, the number "Politics and Poker" sung by Ben and his cronies is both hilarious and telling. It's also interesting to see a Republican painted as a crusading reformer working for the people while the Democrats are the ones neck deep in corruption. However the musical is also rather dated and often lacks the urgency needed to really make the story shine. Not only does the entire work feels like a nostalgia piece, but it also never really gives one a sense that it's actually taking place in the time and era depicted. A dynamic and forceful presence, Rutigliano is competent enough as LaGuardia, but there is not that much of an emotional connection to the man portrayed, making one feel more a passive viewer to what is going on rather than an active participant. Hensley on the other hand makes for a wonderful political boss, while Andrew Samonsky and Adam Heller are good as LaGuardia's loyal assistants--Samonsky having an excellent singing voice and Heller providing some nice comic relief. Baldwin is fine as LaGuardia's wife and Dilly is rather endearing as Marie. Also quite enjoyable are Jenn Gambatese and Jeremy Bobb in a subplot that starts off sweetly and provides an interesting counterpoint to the main plotline. Sadly, these two characters are suddenly dropped in the middle of the second act which results in their story being more than a little unfinished. The score by Bock and Harnick is wonderful and is probably the main reason to see the show in the first place. In addition to the afore-mentioned "Politics and Poker", another good number is the wry "The Bum Won", sung in the wake of LaGuardia's first Congressional victory. Other highlights include the very lovely "I Love A Cop", sung by Gambatese; "Marie's Law", a great piece combining the topics of politics and matrimony, as sung by Dilly and Heller; and the haunting ballads "When Did I Fall In Love" and "The Very Next Man", sung by Baldwin and Dilly respectively. Elsewhere, Emily Skinner does a nice job with "Gentleman Jimmy", a political song about James J. Walker, LaGuardia's opponent in the New York Mayoral Race. It's a song which doesn't do much to move the plot along but it's very nicely staged and fun to watch. The Encores! production also boasts a new song by Bock and Harnick, according to the show program, one added at a pivotal emotional point for LaGuardia. Sung by Rutigliano, it includes some rather pointed political musings about how the voters can get swept off their feet by a politician who's more style than substance, and how those voters must then pay the price for the choices they make at the ballot box. Direction by Gary Griffin works well, keeping the story moving nicely with no feeling of extra padding or lag time. The Encores! Orchestra under the direction of Rob Berman is excellent as always. Fiorello! makes for a fun time at the theatre and even though this just finished Encores! production was not all that spectacular, it was still nice to see the company look back on where they started as they start getting ready for the next 20 years of presenting forgotten or overlooked musicals to a new generation of theatregoers.